Ju 88A-4 serial number 2045 crashed near Brønderslev 31/8 1943. The aircraft belonged to 10./ KG 30 and was coded 4D+GU. The Ju 88 crashed at Kraghede about five kilometres southeast of Brønderslev at 17:00 hours when it unintentionally touched the ground and was 90% damaged. The Wop was unharmed while Pilot Unteruffizier Rudi Mann, Navigator Karl Rethorst and Air gunner Arthur Seefelder all suffered from damage to the head and one of them a broken finger. 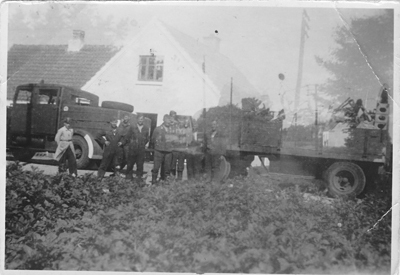 The aircraft “landed” in a field belonging to a farm at Wittenborgvej road 20. The crew walked over to the local grocery store at Kraghedevej 215 and borrowed the phone from Grocer Anker Jensen to call back to base. A call was also made for Doctor Jensen of Sulsted who soon arrived and treated the flyers. After a while personnel arrived from Aalborg to guard the plane and the flyers were taken to Krankenrevier Fliegerhorst Aalborg West. The wreck was removed after about a week. The German recovery crew taking a rest by the grocery store in Kraghede. Sources: RL 2 III/1191, WASt, LBUK.